I haven't found many reliable examples of this group of fish. I believe the fish pictured is probably Percichthys trucha but I am not completely sure. It is certainly related and from that area but it could possible be another similiar species in the genous Percichthys. 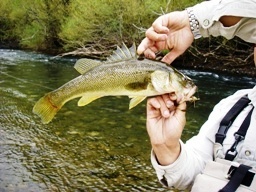 The Creole Perch aka Smallmouth perch is native to South America.